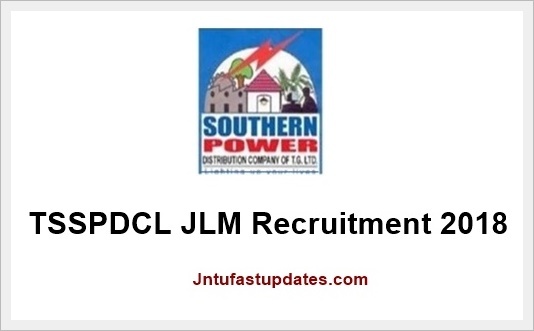 TSSPDCL JLM Recruitment 2018: Southern Power distribution company of telangana limited has released recruitment notification 2018 to fill 2440 junior lineman (JLM) vacancies. Eligible candidates can apply online for TSSPDCL latest Recruitment at tssouthernpower.com. Applications are invited from eligible candidates for filling-up of 2440 vacancies of Junior Limana (JLM) in TSSPDCL. Detailed Notification can be seen in TSSPDCL website www.tssouthernpower.com at Careers link. Applications are invited On-line from qualified candidates through the proforma Application to be made available on http://tssouthernpower.cgg.gov.in to the post of Junior Lineman. Junior Lineman: Must possess SSLC/SSC/10th Class with I.T.I. qualification in Electrical Trade/ Wireman or 2 years Intermediate Vocational course in Electrical Trade only from a recognized Institution/Board of combined A.P/ Telangana State Education Department as on the date of notification. Mode of Payment of fee : Candidate has to visit the website http://tssouthernpower.cgg.gov.in to view the detailed notification and User Guide. The fee mentioned at Para- I (5)(a) is to be paid online by visiting the link MAKE PAYMENT in the website duly following online instructions. After payment of Fee, the Candidate has to click on the link SUBMIT APPLICATION to complete the process of application submission. The applicants have to invariably fill all the relevant fields in the Application. Immediately on submission of application the Applicant will get an acknowledgement in the form of a downloadable pdf document. The fee once remitted shall not be refunded or adjusted under any circumstances. Failure to pay the examination fee, application fee wherever applicable will entail the total rejection of application. When this notification will release. In how many days this notification Wil realised. Give me expected time. to prepare.